LOS ANGELES: US detectives analyzed DNA to capture the former policeman alleged to be the notorious “Golden State Killer” but it was a book that sparked renewed interest in the murders. “I’ll Be Gone in the Dark,” a chilling true-crime bestseller by Michelle McNamara, was published after she died suddenly in her sleep in 2016, and is to be adapted into a documentary series for HBO. 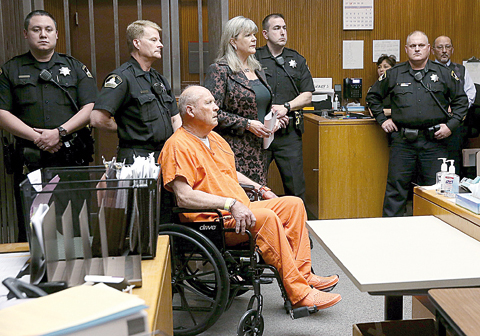 Joseph James DeAngelo, 72, arrested after a 40-year search, was charged Friday with the 1978 murders of a newlywed couple shot dead in Rancho Cordova, a suburb of California’s capital Sacramento. He is a suspect in 10 other murders committed in California between 1976 and 1986, according to authorities, while the Golden State Killer has been linked by DNA or other evidence to more than 50 rapes. “Think you got him, Michelle,” McNamara’s husband, the entertainer Patton Oswald, tweeted following the arrest on Tuesday, with horror writer Stephen King and the actor Rob Lowe also praising her steadfast work. It was the latest in a string of stalled or dead cases given fresh impetus by journalists, including the probe into real estate tycoon and multiple murder suspect Robert Durst, and the dubious conviction of Adnan Syed made famous by the acclaimed “Serial” podcast. Sacramento County Sheriff Scott Jones has denied that McNamara’s book put investigators on DeAngelo’s trail but admitted it had revived public interest and generated a flood of new leads. The author, who could almost have passed for Jodie Foster’s FBI trainee Clarice Starling in “The Silence of the Lambs” (1991), set out her theory in a 2013 article for Los Angeles magazine that “marketing matters” in the solving of murders. The authorities had entrusted her with a neighborhood plan found at the scene of one of the crimes, likely drawn by the killer, in the correct calculation that the story would prompt calls. Paul Holes, a now-retired Contra Costa County District Attorney’s Office investigator whom McNamara contacted for her book, considered her “an investigative partner,” he told CBS news magazine show “48 Hours” last year. Even though satisfied that the police would eventually use advances in science to flush out the killer, the insomniac author had become exhausted, taking powerful anti-anxiety drugs that contributed to her death. “He can’t hurt me, I say, not realizing that in every sleepless hour, in every minute spent hunting him and not cuddling my daughter, he already has,” McNamara wrote. Launched in December 2015, Netflix’s “Making a Murderer” featured the 2007 killing of Teresa Halbach in Wisconsin, for which Brendan Dassey was convicted. The series raised questions about the US legal system and prompted many to believe Dassey and his uncle Steven Avery were wrongly convicted of the killing. A federal court in Wisconsin found in 2016 that Dassey, over the course of multiple interviews, had been tricked into confessing-both by police and an unsympathetic private investigator working for his defense attorney. Business magnate Robert Durst was arrested three years ago in a New Orleans hotel room hours before the final episode of the six-part HBO investigative documentary “The Jinx: The Life and Deaths of Robert Durst.” The series delved into the disappearance of his wife in 1982 as well as the killing of his friend Susan Berman in 2000 and the 2001 death of a neighbor in Texas who was found dismembered.